The Battle of Philippi also known as The Philippi Races 3 June 1861. Union, under Colonels Benjamin Franklin Kelley and Frederick W. Lander, 3,000. Killed, 2, wounded 2, missing 2. Confederate, under Col. George A. Porterfield, numbers not reported. Killed, 16 wounded, unknown missing 26. In conformity with our plan we proceed to narrate the progress of battles in the order of their succession, which carries us, in rapid transition, from one portion of the country to another, and brings each action vividly before the eye as it transpires. 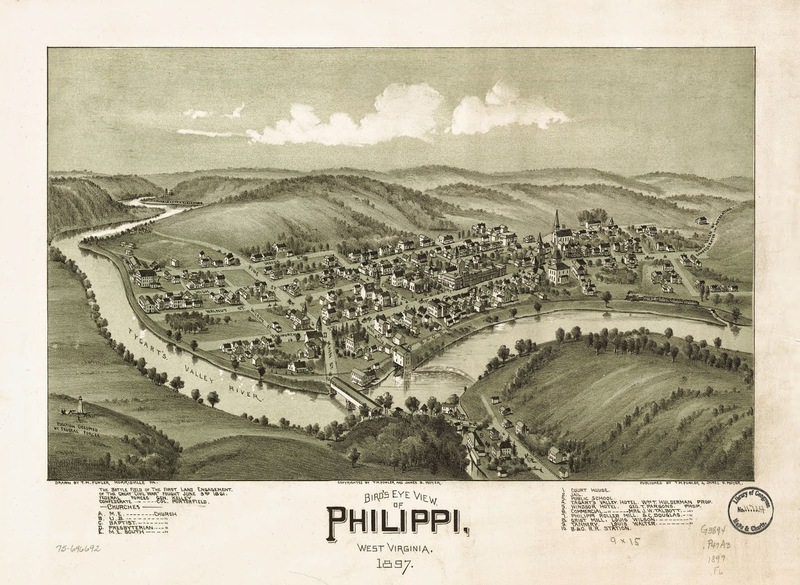 The most important engagement, after the fighting in the streets of Baltimore, the occupation of Annapolis and Alexandria, and the attacks of the enemy's batteries on Aquia Creek, was that at Philippi, in Western Virginia, on the 3 June 1861. The Union forces, under the command of Brigadier General Thomas A. Morris, were in the possession of Grafton. The rebels were at Philippi, under Colonel George A. Porterfield. Having determined to send out an expedition to surprise them, it was organized in two divisions one, consisting of the First Virginia Regiment, and the Ninth and Sixteenth Ohio, under the command of Colonel Benjamin Franklin Kelley the other, of the Sixth and Seventh Indiana, the Fourteenth Ohio, and a section of artillery, under the combined command of Colonels Ebenezer Dumont and Frederick W. Lander. They set out on their march in a terrific storm, through an unexplored and uneven country, on the night of the 2d of June. At four o'clock in the morning. Frederick W. Lander, who was to attack the enemy in front, took up his position across the river on a hill commanding the town. Benjamin Franklin Kelley was to attack them in rear. The plan matured at headquarters failed in its execution. Benjamin Franklin Kelley was impeded in his march of twenty-two miles by roads rendered almost impassable by the darkness of the night and the violence of the storm. On arriving, he found the town aroused instead of surprised, and Frederick W. Lander already engaged with the enemy. To add to the discomfiture caused by the lateness of his force, it came up in the wrong direction. Recovering from this error, however, it charged upon the enemy's encampments with improved promptness and great gallantry. Frederick W. Lander's batteries had in the mean time done terrible execution. Suddenly, while Benjamin Franklin Kelley was pressing them closely, he came down the hill like a thunderbolt, and joined iii the pursuit of the enemy. In this action Colonel Benjamin Franklin Kelley was severely wounded. Sixteen of the rebels were killed several wounded and taken prisoners, and a large quantity of camp equipage, arms, etc., were captured.